You need the right information and a savvy negotiating strategy to get the lowest price and cheapest loan on a new car or truck. The salesperson hopes you'll go shopping without knowing how much the dealership paid for the car you want, how much other consumers are paying for similar models, whether any discounts are available or how much you should pay for a loan. Without that information, you'll wind up paying thousands more than you need to — almost guaranteed. That's why our 5-step plan for driving away with the best deal can make you a smarter, more confident buyer. Step 1. Decide how much you should spend. Once you've picked the new car or truck you want, go home and get ready to negotiate. Start by finding out how much you should pay at Edmunds (www.edmunds.com) or Kelley Blue Book (www.kbb.com). MSRP. This should be very close to the suggested retail price on the sticker. If it is, then you know you've put in all of the right information. Invoice price. This is the price the dealer paid for the car. Average transaction price. Edmunds calls this "What Others Are Paying." Kelley refers to it as "The New Car Blue Book Value." It usually will be somewhere between the retail price and invoice price. Your goal price should be somewhere between the invoice price and the average transaction price. Being a smart consumer should allow you to pay less than the average consumer. If, for example, the invoice price is $22,000 and the average transaction price is $22,600, then you should set a goal of paying between $22,200 and $22,400, not counting any rebates. Step 2. Decide which discount to take. Now use our links to see whether any rebates or low-cost financing options are available on your car. If you have a choice between a rebate and low-cost financing, you need to pick the discount that will save the most money. Let's say you're going to borrow $18,000 over 60 months and have a choice of two loans: 3.00% from a bank you found on our site or a discount rate of 0.9% from the automaker's finance company, like Ford Credit or GMAC. If you took the bank loan, your payments would be $323 a month, and you'd pay $1,406 in interest over the life of the loan. If you took the discount financing, you'd pay $307 a month and $414 in interest over the life of the loan. Now, look at the difference between the total costs of the two loans. In our example, it's right at $1,000. If the rebate is more, take the rebate. If not, take the cheap financing, which will have to be arranged through the dealership. Those subsidized loans can only be made by a single lender that's owned by or affiliated with the automaker. Our Rebate vs. low-cost loan calculator allows you to compare any amounts, any rates, quickly and easily. Step 3. Line up a loan. If you're not going to take a discount loan from the manufacturer, you need to find the cheapest possible way to finance your purchase. Our most recent survey of major lenders shows the average annual interest rate for 36-, 48- and 60-month auto loans is just over 4%. So, unless you have below-average credit, there's no reason to pay more than this. Indeed, you should qualify for a lower rate. 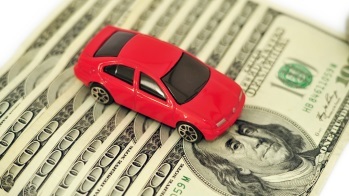 Just check our database of the best auto loan rates from scores of lenders. Pick a bank or finance company offering one of the best deals. You can usually apply online and be approved within hours if not minutes. Now you know how much you're going to pay, how much you have for a down payment, how much you're going to finance and what that loan will cost. Finally, use our auto loan calculator to get a good idea of what your monthly payments will be. Just enter the price you expect to pay, the loan rate and term, and the tax rate and fees the dealer provided. If you can afford the payments, you're ready to go back to the showroom. Step 4. Make an offer. Buy at the end of the month, when salespeople are trying to make quotas and the dealership is striving to meet its budget for revenue and profits. Show up an hour before closing on Friday, when everyone is anxious to start the weekend. 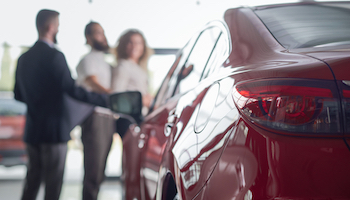 Tell the salesperson you're ready to buy today, and ask how much he or she wants for the car. The salesperson probably will consult with the dealership's sales manager. If he or she comes back with an offer below sticker price, that's a good sign. Respond with a counter offer that's only about $100 above the invoice price. Sometimes the salesperson will resist taking your bid back to the sales manager, saying it's just too low. Always remember that your salesperson and the sales manager are professional negotiators, working as a team to get you to pay as much as possible for their product. They want to see if they can get you to raise your offer without having to make a counter offer of their own. Don't budge. Insist the salesperson take your offer to the sales manager. After you've gone back and forth several times, you should have reached the price you decided to pay back in Step 1. If the sales manager is willing to accept that, you've got a deal. If not, that's your cue to graciously end the negotiations and try another dealer. Step 5. Finalize your financing. Once you've got a deal, you'll usually be introduced to the dealership's finance officer. The auto loan you found in Step 3 will almost always beat the best deal the finance officer can arrange through the lenders he or she works with — unless, of course, you chose to go with a discounted loan from the automaker. But there's no reason not to ask for the best financing offer the dealership can come up with and choose the least expensive option. Just showing up with your own loan protects you from one of auto-buying's most expensive mistakes — finance charge markups. 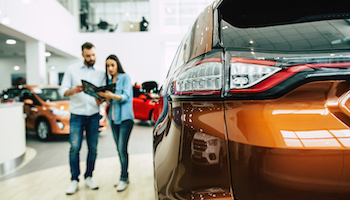 When customers don't know how much an auto loan should cost, dealers can tack three percentage points or more to the interest rate its lenders are willing to charge. The dealer and lender split the extra profit, and the practice is perfectly legal. Customers don't have to be told that they're not getting the lowest possible interest rate.